Bayanihan Linux was a complete open source-based desktop solution for office and school use. It was a package that includes an operating system, a word processor, spreadsheet program, presentation software, email facility, an internet browser, and a graphics editor. This complete system was packaged in a single easy-to-install CD. The word "Bayanihan" relates to a Filipino tradition where people in a community help their neighbour in physically moving their house to a different place. 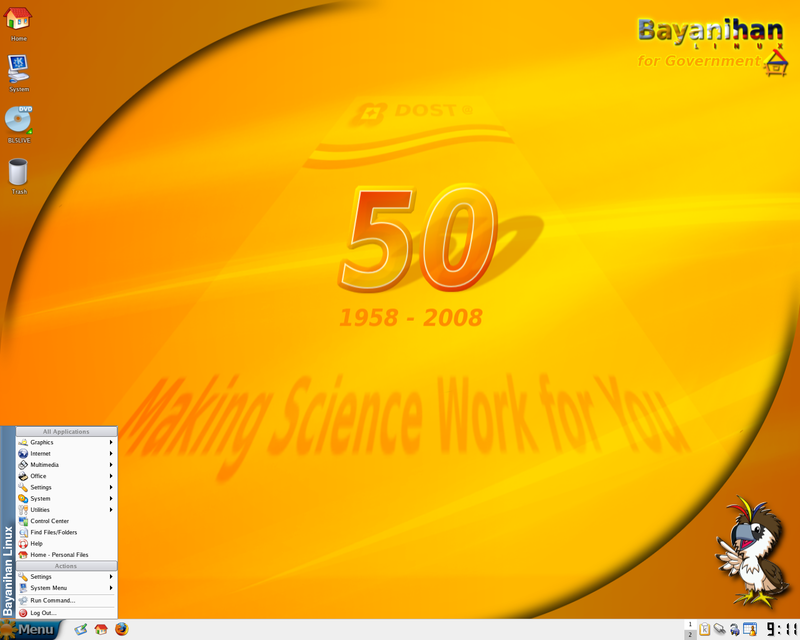 The most recent versions of Bayanihan Linux are based on Debian GNU/Linux; previous releases (3.1 and earlier) were based on Fedora Core and Red Hat Linux. Rate this project Barry Kauler has announced the availability of a new version of Quirky, a lightweight Linux distribution and sister project to Puppy Linux. The new version changes the base packages of the distribution from Ubuntu 16.04 to 18.04. "The transition has been made to building with Ubuntu Bionic Beaver 18.04.1 DEBs, and now codenamed 'Quirky Beaver', first release is version 8.7.1, for x86_64 PCs. Some announcement blurb: Quirky Linux 8.7.1 is the first in the 'Beaver' series, binary-compatible with x86_64 Ubuntu 18.04.1 LTS, though built with woofQ and architecturally very different from Ubuntu. Quirky is an experimental distribution, that forked from Puppy Linux a few years ago, and has followed a different path, exploring some new ideas. Continuing the Puppy tradition, Quirky has a 'complete' suite of applications, drivers and utilities, in a very small size. Version 8.7.1 is very similar to 8.6, but with a complete upgrade of package versions. The kernel is now 4.18.9." Further information can be found in the project's release announcement. Download: beaver64-8.7.1.iso (461MB, MD5, pkglist). Also available from OSDisc.